I was recently invited to a dinner at the newly opened Sultan Mediterranean Grill in San Juan. Mediterranean food is one of my favourite cuisines in the world (hello, slow-cooked lamb shank), so when food blogger Aldous sent me the details for the dinner, I said yes before I finished reading the email. Ha! Inspired by the historical Sultan leaders of the Ottoman Empire, the restaurant serves culinary delights from traditional shawarma, lamb shank, kebabs, horiatiki, moussaka, curry and more. 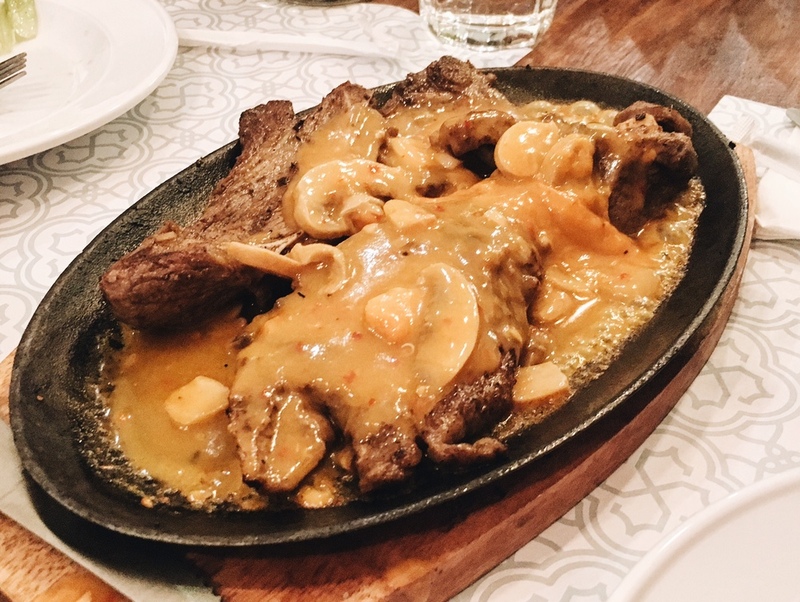 The existing Sultan Grill in Makati, open since 2010, grew so popular that they've now developed a second branch. The restaurant is tucked away along Wilson Street in San Juan, Manila. The interiors of Sultan Grill are extremely satisfying in their minimalism and cleanliness. The decoration, the furniture, the tableware, and even the lighting all contribute to a highly Instagrammable culinary experience, which is hugely important these days, eh? Between eight people, we shared about 10 different dishes in total, including the Sizzling Lamb Chops, Roasted Lamb Shank, Kebab Platter (chicken, lamb, and beef), Moussaka, Keshmishi Rice, Vitamin Boost Salad, and more. Before the food arrived, I decided to order a banana yoghurt shake (P90). Sugar, banana, yoghurt - what's not to like? (Well.. unless you're lactose intolerant, allergic to banana, or on a diet.) Tasted OK! After our drinks were served, the food came out. Earlier in the day I'd subjected myself to a single boiled egg for lunch in anticipation of the dinner, so I had to stifle my hallelujahs once the food was finally brought out and when fellow bloggers had finished taking their photos. The food was decent, not groundbreaking. It wasn't the best Mediterranean I've ever had, but three dishes stood out to me as ones that I would possibly order again. I am a salad fiend. Friends and family enjoy ripping me to shreds every time I order a salad, but genuinely, I find salads one of the most exciting, versatile and yummy things to eat when done right. Sultan's Vitamin Boost salad was good enough: fresh lettuce, cucumber, quinoa, red onions, oranges, dried cranberries, walnuts, orange-cranberry dressing all play a role. My second fave dish was the beef, cheese and eggplant Greek Moussaka, which was baked like Italian lasagna. This had that mushy delicious texture that makes it hard to stop eating. I do wish it had been denser, though, and more flavourful. (Did I mention that lasagna is one of my ultimate top favourite foods? No? Well, here I am saying it. Also, eggplant. One of earth's best ever vegetables.) I'm not sure that this slice of moussake was worth P205, but hey. Not only is it lamb, but it's slow-cooked Mediterranean lamb. This was fairly good! It's hard to find decent lamb dishes in the Philippines (maybe I've been looking in the wrong places, who knows?) but also, I'm SUCH a lamb shank fan. Sultan's lamb was tender, flavourful, and not dry. The lamb held a satisfying amount of moisture and went well with the accompanying sauce and spinach pilaf rice (which again felt a little too dry for me). Low heat and slow-cooking for the win. Here are some more photos of the meal! As I sipped my mint green tea and rested my tender digestive system, ice cream was served. The flavours came in Basil, Nuts and Roses, Salted Caramel and Vanilla. I opted for the Nuts and Roses. I couldn't taste much apart from the actual pistachio chunks, and rose is a pretty subtle taste - I don't think enough rose flavouring was used during churning. I couldn't finish it, but I had a go. Who turns down ice cream?! Unless you're vegan or vegetarian, you really can't go wrong with dining at Sultan Mediterranean Grill. 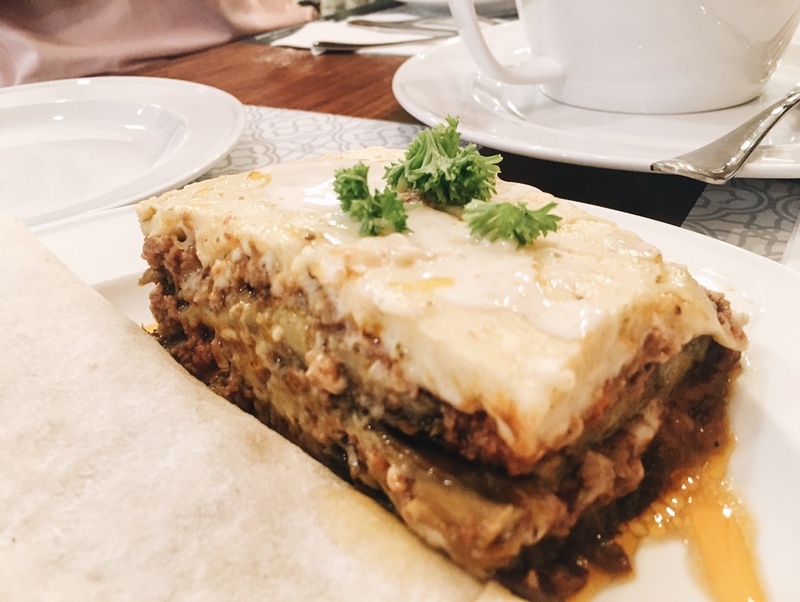 Although the food doesn't stand up to other Mediterranean restaurants such as Cyma, especially in terms of price, you could do worse than Sultan, which is quick, comforting, and affordable. My main gripe was the dryness of the rice, which I attempted to combat with the garlic mayo table sauce. Head to Sultan for your next Mediterranean food fix, and remember that you can get 20% off meals for the rest of the month at the San Juan branch. Visit sultanph.com for the full menu with prices! This meal was a complimentary arrangement by Sultan Mediterranean Grill.